Two years ago I was a struggling single mother working twelve hour shifts at a child care as preschool teacher making $9.04 an hour. The quality of the center concerned me and so did my future there. I knew that I would never move up professionally. I wasn’t offered the necessary support or training. I didn’t make enough money to support my children nor did I have any time with them since I had to work almost sixty hours a week just to make ends meet. Twenty six and 1/2 years! That is a long time to be devoted to one's work. Shelley started at Northwest Indian College in January, 1989 and has been there through July, 2015 without any intervening work breaks throughout that entire time. There are many things that are remarkable about Shelley. One of them is her scurrying from one place to another on campus. Another is her constant friendly persona and yet another is her love of children and her dreams to make the world a safe and welcoming place for all children. On Friday May 15, 2015 the Northwest Indian College Early Childhood Education Leadership Team, in partnership with the Sacred Little Ones ECE Initiative, hosted our final Professional Learning Community of the academic year, and combined the event with our “Celebrating Early Childhood Education Students” dinner. Our annual spring celebration is designed to recognize the unique efforts and contributions that students have made to the ECE program at Northwest Indian College. Get the kids to bed! Research says 8 to 10 hours a night! Is that why we had a meltdown at the grocery store today? Is the baby going to sleep tonight? How on earth am I going to function at work? Did I buy diapers? Are we feeding our kids enough vegetables? Did we order the middle school yearbook? Why oh why can’t I have more that 2 cups of coffee a day…is that really spit up on my shirt? HOW LONG AS THAT BEEN THERE!? The W.K. Kellogg Foundation has identified the Sacred Little Ones Early Childhood Education Initiative as an exemplary funded program. They are in the process of producing a film about racial equity in education, featuring the Sacred Little Ones project and Northwest Indian College's very own Shelley Macy, Sacred Little Ones Principal Investigator and Project Co-Director. During my trip to Albuquerque, New Mexico, I did a lot of things for the first time. I went on my first plane ride, rode on tramway for the first time, and attended my first conference. This experience was the best in a lifetime. I have never met so many young, powerful Native Americans. I felt very important… They way that people talked to me and looked at me… They made me feel like I was somebody. I made a lot of great friends! 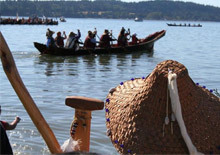 Things are moving fast at the Northwest Indian College and the Lummi community. 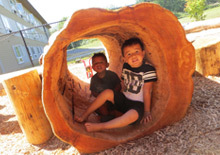 The last 3 ½ years of collaboration and planning on behalf of the Sacred Little Ones project leadership and partners has created many exciting new opportunities for families and children in the Lummi community. Our first Family Engagement activity was an Ey’ Snat Family Fun Night in September held in conjunction with Sacred Little Ones partner site Lummi Head Start. We wanted families to get to experience a salmon barbeque with salmon cooked in the traditional way. At the November Sacred Little One's Professional Learning Community, we had the unique opportunity to meet for a print-making workshop with Ramon Murillo, Art Instructor at Northwest Indian College. This experience provided a space for teachers of Lummi children across systems to hear about the work of this local Native artist. It was a privilege to be provided with the opportunity to think about how we could represent our identities and what is important to us as people and teachers dedicated to building welcoming and inclusive experiences and learning environments. On October 19th, 2014 Alicia Allard, Director of NWIC Early Learning Center, traveled to Barrow, Alaska to visit Iḷisaġvik College on behalf of the NWIC Sacred Little Ones team. Alicia was honored to accompany Dr. Tarajean Yazzie-Mintz, Program Officer for the Wakanyeja Sacred Little Ones Initiative; and Dr. Danielle Lansing, Project Director and ECE Coordinator at the Southwestern Indian Polytechnic Institute. In June, a group of Lummi parents honored the bus drivers from Ferndale School District and Lummi Nation School with a specially prepared and served luncheon. These parents wanted to let bus drivers know that they understand their job is both important and challenging. They thanked them for transporting their most precious cargo to and from school every day. I am so thankful to the Sacred Little Ones Grant and Heather Jefferson for the opportunity to use the Lummi Language Literacy Kit with my students over the last 4 weeks. On August 12th-14th 2014 staff and administrators from Sacred Little Ones supported program at Lummi Childcare, Lummi Head Start and the Northwest Indian College Early Learning Center attended the 2014 Tribal Early Care and Education Conference hosted by the Washington State Department of Early Learning. The conference was held at the beautiful Great Wolf Lodge on Chehalis Tribal land in Grand Mound, Washington and was attended by numerous tribal early childhood programs. We were proud to have a large group of attendees representing the Lummi Nation’s early childhood programs. The American Indian College Fund, Northwest Indian College, and the Lummi Community partners and families will engage in collaboration to strengthen the central role families play in early learning opportunities. We will learn not only how to engage and sustain authentic partnerships with families, but also what the innovative activities are which heighten families’ opportunities to meaningfully shape their child’s/children’s early learning outcomes, in preparation for school readiness and success in life. The Menominee people were the gracious hosts of the Sacred Little Ones Annual Convening, which took place in June 2014. When we arrived, we were greeted by Dr. Tarajean Yazzie-Mintz, Sacred Little Ones Program Officer at the American Indian College Fund. It was nice to see the peoples of the land history recorded on a special channel in our hotel room. The next morning, a few took advantage of a morning walk and we were able to get acquainted with one another. On Friday, June 20, 2014, Northwest Indian College celebrated its commencement at the beautiful Wexliem Community Building. The Class of 2014 consisted of 115 students earning either their two-year or four-year degrees, or their General Education Diploma. Dr. Dakotah Lane, a Lummi tribal member, was our keynote speaker. He shared his story about graduating from the University of Washington, joining the Peace Corps, and attending medical school at Weill-Cornell Medical College. Dr. Lane also shared with our graduates his plans to return to his reservation to work as a physician at the Indian Health Services clinic, upon completion of his residency. 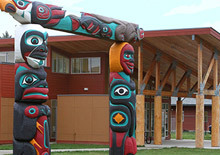 Northwest Indian College has a strong history of educating and supporting the next generation of early childhood professionals. Our early childhood program reflects the mission of Northwest Indian College to promote indigenous self-determination and knowledge by preparing students to carry on the tradition of providing quality early childhood education for tribal programs. Ashia Smock, founding co-director for the Sacred Little Ones Project at NWIC has accepted a position at Lummi Behavioral Health, where she will have the opportunity to work directly with children and teachers at the Lummi Early Learning Programs as a Social Worker. Ashia interned at Behavioral Health for six months as she completed her MSW from the University of Washington, and they just couldn’t let her go. Though we will miss her in the day-to-day operations of the Sacred Little Ones project and at the ELC, we are excited for her and for this opportunity to work more closely with Behavioral Health within Head Start. Ashia is also finishing up her training to become a certified Hand In Hand “Parenting by Connection” instructor. She will continue to work with the Sacred Little Ones goals of helping families and teachers handle children’s emotional moments and improving children’s social and emotional skills and development.